Dilmah’s Ethical Tea Society directly addresses Dilmah Founder Merrill J. Fernando’s vision of making business a matter of human service. The society harnesses the enormous goodwill and creativity of the Global Dilmah family of partners and their networks of consumers and well-wishers to benefit the underprivileged and the environment. Heroes of the MJF Foundation commends these countless heroes who have dedicated their time to brightening and enriching the lives of those in need of our support. Born and raised in beautiful Mauritius, Selvana Chelvanaigum, took her first step into the world of Culinary Arts studying at the Hotel School of Mauritius. She continued her further studies at both the Bellouet Conseil in France and at the William Angliss Institute where she completed her Diploma in Hospitality in Management and Patisserie. Now a Head Pastry Chef and Patisserie Teacher, Selvana gathers inspiration from nature and works with ingredients from across the world to give traditional dishes a modern twist; her current favorite ingredient to build on tradition and enhance the palette, is tea. Selvana exemplifies leadership qualities and professionalism backed by consistent and verifiable record of achievement. She opened the Tea Room at the National Gallery of Victoria (NGV), Australia, which now serves one of the finesse high teas in Melbourne. She is also the Ambassodor of the NGV. 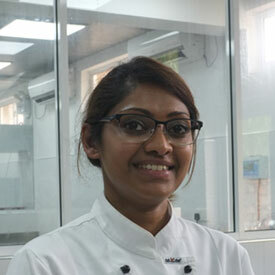 She is a trainer and Member of the Patisserie Industry Advisory Group at the William Angliss Institute and a trainer at the ANIBT Hotel School. Selvana also holds the Gold Medal 2015 for Sustainability and Presentation at the Dilmah Global High Tea Competition, and was the National Winner of the Dilmah High Tea Challenge 2012. Selvana spent ample time with the children of Dilmah’s National Center for Children with Cerebral Palsy and Other Development Disorders, where she cooked a delicious meal for them. She also volunteered to lecture and train the students at the Merrill J. Fernando Charitable Foundation Culinary Training Center for a week, where she not only cooked with the students, but cooked for them. Armed with a trade qualification in the field of Professional Cookery and a SIT50307 Diploma of Hospitality from Académie Accor, Sean Collins is the Executive Chef at Novotel Brisbane. 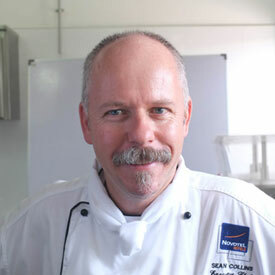 As Executive Chef, Sean carries out a host of duties including but not limited to daily monitoring of the Hotel’s five food production and service outlets, guides staff, develops and markets menus, and conducts brand consultancy, inter-hotel operational audits and food and beverage service operations. Sean is also the Chair of the Food and Beverage Procurement Committee for South East Queensland and also sits on the Queensland and Northern Territory Food and Beverages Strategy Committee that monitors operational initiatives and best practice of the 32 hotels within the region. Sean imparted his expansive knowledge and experience to the budding chefs of the Merrill J. Fernando Charitable Foundation Culinary Training Center over a week long program celebrating 10 years of MJF Kids. He also spent time with the kids at Dilmah’s National Center for Children with Cerebral Palsy and Other Developmental Disorders where he spent the day cooking them a delicious meal. Volker Marecek has more than 14 years experience as an Executive Chef, a position at which he has excelled. Volker was first appointed Executive Chef for the 5 Star Berkeley Court Hotel in Dublin, Ireland, which was a leading hotel of the world, among countless other achievements during his time here, he achieved 3 RAC rosettes for the Berkeley Room. Four and a half years later, he was made Executive Chef for the opening of the 5 Star Swissôtel Tallinn, Estonia; the first international 5 Star hotel in Estonia. 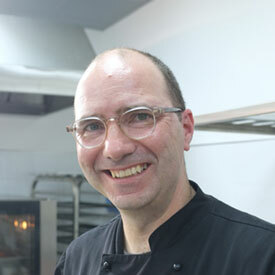 Currently, Volker is the Executive Chef of the 5 Star Langham Hotel, Auckland, New Zealand, where his afternoon tea spread was voted Best Afternoon Tea in 2009 and 2010. He is also a Guest Judge on the Reality TV Show MasterChef New Zealand. Volker spent time with the kids of Dilmah’s National Center for Children with Cerebral Palsy and Other Developmental Disorders, dedicating his time and skills to cooking them a delicious meal, taking away from the usual rice and curry. He also volunteered at the Merrill J. Fernando Charitable Foundation Culinary Training Center, where he taught the students of the center over a week long program celebrating 10 years of MJF Kids. 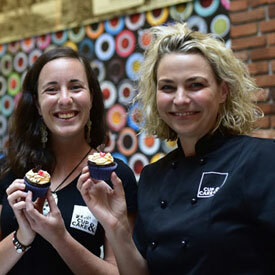 Award Winning New Zealand Chefs Jaimie Stodler and Josephin Geimecke, of Cup & Cake Queenstown, volunteered at the MJF Charity Foundation from 3rd - 6th February 2017. Their time, knowledge and kindness benefited hundreds of impoverished kids and young adults at the MJF Charitable Foundation; it's been an amazing journey for the MJF kids, cerebral palsy kids and kids with other developmental disorders, and empowered women in the Women's Development Programme. The volunteer chefs got their hands dirty at the Organic Farm (DCSARC), played with puppets with marginalised kids pulled out poverty by the MJF Foundation, conducted baking lessons for mothers in the Women's Development Program, taught the Empower Culinary and Hospitality School's new batch theory on the basics of baking (with a hands-on practical lesson to making a Tea Inspired Earl Grey tea-infused cupcake), participated in dancing classes and "Drama lessons” with students of the Rainbow Centre, played volleyball with the teachers, volunteered at Mankada and Dilmah Conversation projects in Uda Walawe, helped at the school of inspiration in Koulara during a crafts class, and prepared healthy dishes at the National Centre for Children with Cerebral Palsy and Developmental Disorders while teaching the parents and teachers how to as well. We welcome them with open arms to Dilmah's Ethical Tea Society and thank them for all that they do. "The opportunity to meet and hang out with these children was amazing, a life changing experience that I know both Josie and I felt. For that I cannot even begin to thank you for organising this, or for allowing us to be a part of the MJF Foundation, Cerebral Palsy Centre & the School of Inspiration. All of the kids we so great! Being a mom it's hard to be away from your child, but being with these kids was such a great consolation. The chance to meet and work with all of the people within MJF foundation and the Dilmah School of Tea was life changing. Sri Lanka is an absolute diamond. The people, the scenery, and the culture was totally unique to anything I have experienced, and watching what Dilmah, and specifically Merrill and Dilhan have created is so inspiring. It's amazing what you can achieve with an awesome team to back you. As a business owner I am forever changed." - Jamie Stodler, chef and owner of Cup & Cake, Queenstown, New Zealand.